Of all the cities found in HP Lovecraft's vision of Massachusetts, perhaps none is quite so deadly as the small fishing village of Innsmouth. Decrepit and dying, Innsmouth is being consumed from within by an ancient pact once made to save the town. The investigators will find every hand turned against them as they explore its rotting docks and fetid beaches. In the end, perhaps the only way to save Innsmouth is by destroying it along with the terrible creatures that haunt its waters near Devil Reef. 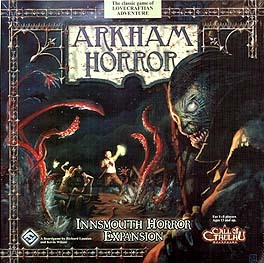 Innsmouth Horror requires a copy of Arkham Horror to play.